AND GIVE YOUR MANAGEMENT CAREER A BIG BOOST! Get certified and start reaping the benefits of your newly gained knowledge! Be assured that this program is by far the best value-for-money. ExpertRating is an ISO 9001:2015 certified company offering online certification and training services to individuals and companies in over 35 countries. Over 25 million people in 35 countries have benefited from ExpertRating Online Certifications. ExpertRating is the exclusive provider of skills certifications to the world's top-four marketplaces for services – upwork.com; bayt.com; guru.com; and flexjobs.com – and is trusted by thousands of employers for certifying employable skills. 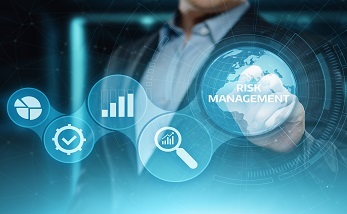 When it comes to certifying your skills as a Risk Management professional, it is advisable to go with a reputable organization that is well-accepted by companies and employers. Risk Management skills are a set of highly-prized and sought-after skills. High-performing organizations that also practice Risk Management meet their project goals 2.5 times more often and waste 13 times less money than their low-performing counterparts. The ExpertRating Risk Management Certification is designed to help you bring the same kind of value to the organization you work for. Divided into two modules, one dealing with Project Management and the other with Project Risk Management, the course gives you a general understanding of all the facets of Project Management and helps you attain an in-depth understanding of various Risk Management concepts and processes and their real-life applications. 1. A ROM estimate is used during which project group? 2. Which of the following is the purpose of creating a project charter? 3. A decision tree analysis shows that the Expected Monetary Value of alternative one is $55,000 and that of alternative two is $40,000. Which of these alternatives would be better to select? 4. When can risk responses be identified? 5. Which of these generally does NOT appear in a project’s risk register? The final test is fully based upon the Risk Management Courseware that is provided as part of the Risk Management Certification. If you go through the courseware properly, you should not have a problem clearing the test. The test consists of multiple-choice questions from different chapters of the Risk Management Courseware. The process of getting yourself certified is very simple. All you have to do is buy the ExpertRating Risk Management Certification Course for $69.99. Log in to your ExpertRating account using your password. Go through the Risk Management Methodology Courseware, which could take from one week to one month — depending upon how hard you work and your level of experience — and take the certification test at your convenience. You can take the test within one year of buying the certification course. The result of the test appears as soon as it is completed and your certificate is mailed immediately. 24 x 7 access to the ExpertRating Risk Management Courseware. You can access the ExpertRating Risk Management Certification course as soon as your payment is processed successfully, and you can complete your Risk Management Certification Course within one year of enrolment. You can buy this Risk Management Courseware (leading to Risk Management Certification) at a special offer price of only $69.99 that includes the in-depth Risk Management Courseware and the exam fee. This is the best value-for-money Risk Management Program available till date. 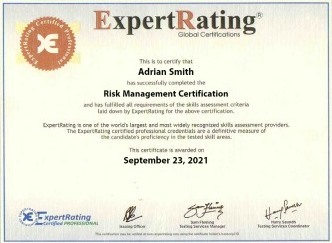 Worldwide airmail delivery of the hardcopy Risk Management certificate is provided. The certificate can be used to prove your certified status and does not mention the word "online". An online transcript is also provided that mentions your score and which you can use to prove your certified credentials on the Internet at any time. A must certification program to pursue your dreams confidently and advance your career in project management industry. Incredible opportunity to learn a new skill. Appreciate it! Practical and very useful information on various project management concepts. A must take for all! Certainly a great program! I gained so much and was happy that I could go at my own pace. Very valuable and reasonable Risk Management Certification. Love this program! So much available at ease and convenience of your home. Thank You! I am amazed by the knowledge I gained through this training course. A boost to my career in the rewarding project management industry. Career prospects in Risk Management have been consistently good since 2004, with more and more jobs being added each year. The U.S. Bureau of Labor Statistics (www.bls.gov) projects that the employment of financial managers, including risk managers, will grow 19 percent from 2016 to 2026, much faster than the average for all occupations. Risk Management professionals make good money. According to Payscale.com in 2017, the salary of a risk manager within the 10th-90th percentile ranged from about $55,006 to $139,808, including bonuses. With a few years of experience at the risk manager level, the total pay can range from $75,516 to $177,979.